The cover letter sample below will give you some ideas and inspiration for writing your own cover letter. You'll notice that this specific letter was written for an administrative assistant. However, you can still benefit from reviewing it even if you're not an admin assistant. Many of the concepts used will translate into writing a cover letter for any type of job that might interest you. You'll be able to use this sample to get a better sense of what a good cover letter looks like, and to get some ideas about what you might include in your own letter. 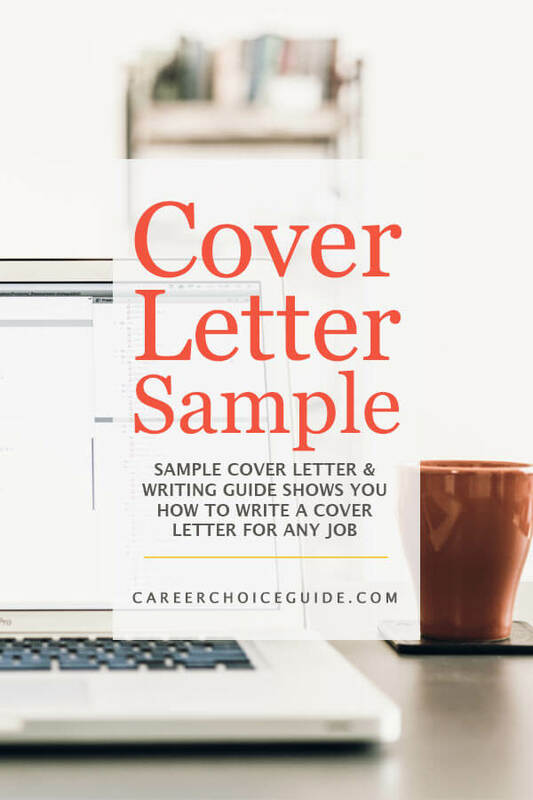 Before we dive into the cover letter sample, I'd like to review some key points that will help you write effective covering letters for any type of job. If you're in a hurry and want to get straight to the sample, click the link below to jump straight to it. Take me straight to the cover letter sample! I earn a commission for purchases made through links on this page. 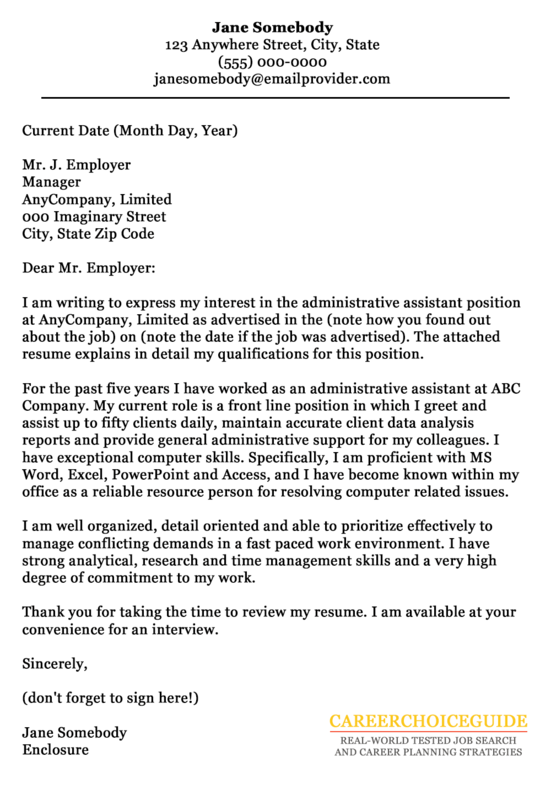 The cover letter sample at the bottom of this page was designed to match with the resume heading on the sample resume shown in the image on the right. If you compare the two documents, you'll notice that the heading with the jobseeker's name and contact information centered at the top of the resume is matched exactly on the cover letter. It is perfectly fine to format your cover letter in the more traditional block style used in formal letter writing; however, I prefer this method of matching the heading on your cover letter with the heading on your resume. Matching the headings on your resume and coverletter is a simple way to make your job search documents look like a professional, unified package. Note that you can also make your reference page match with the same header. When all three documents begin with the same header, your job search documents will form a sharp looking package that creates a positive first impression. If you want to take a deeper dive into cover letter writing, here are three popular books with plenty of samples and advice. The example below follows a standard formula for cover letter writing. You can apply it to any cover letter you need to write for any job. I love this formula because it's an effective tool for busting through writer's block. 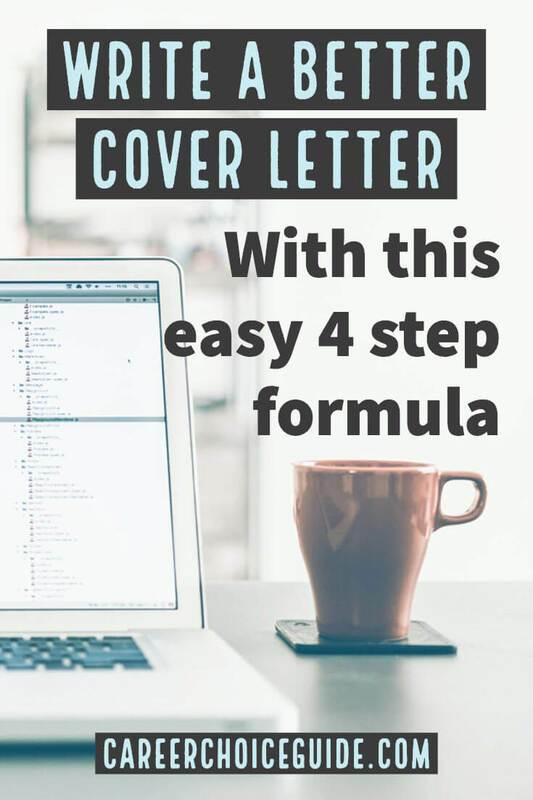 The formula maps out your cover letter for you, so when you begin writing, you're not stuck with a completely blank page and no firm starting point. Paragraph 1 is the "what" paragraph. It tells the employer what job are you applying to. 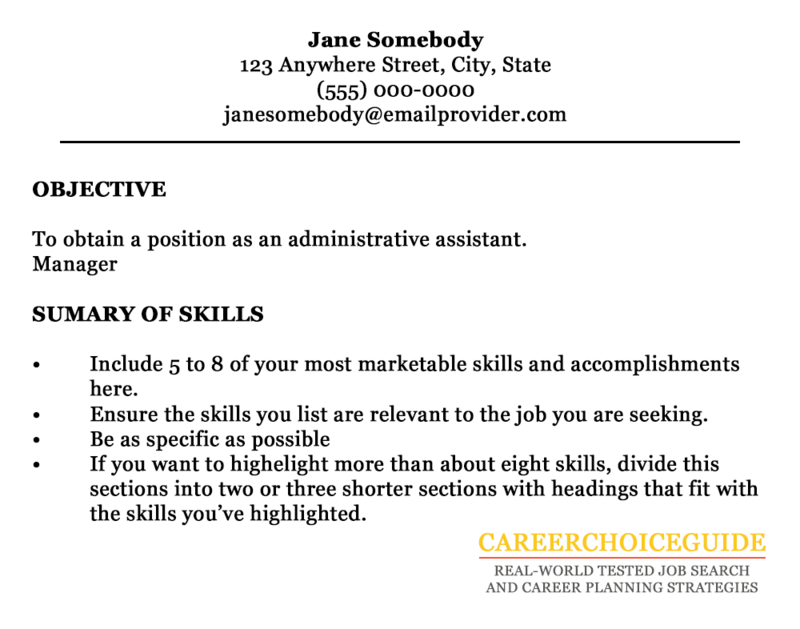 In the example below, the job seeker is applying to a job as an administrative assistant. Paragraph 2 is the "why" paragraph. This paragraph tells why the employer should hire you. In the example, the job seeker has used paragraph two to describe her technical skills and her experience in the field. Paragraph 3 is the "why else" paragraph. This paragraph includes more reasons why the employer should hire you. In the example, the why else paragraph is used to describe personal qualities that make this job seeker well-suited for the job. Most jobs require technical skills, as well as interpersonal skills, so that is often a logical way to divide the "why" and "why else" paragraphs. Spend one paragraph describing your technical skills, and spend the other paragraph describing your interpersonal skills. Which should you lead with - technical or interpersonal skills? Lead with the skills that are most essential to the job you're seeking. If technical skils are most important, put them first followed by a paragraph about your soft skills. If, on the other hand, interpersonal skills are most important in your line of work, lead with those and follow up with your most relevant technical skills. Paragraph 4 is the contact paragraph. In this example, the job seeker has asked the employer to contact her. If she had the employer's contact information and she hadn't been asked not to contact the employer, she could also use this paragraph to tell the employer that she would be calling to follow up on her application for the job. When you sit down to write your own cover letter, do be sure to write your own, unique letter. Do not copy the sample below word for word. In fact, you might even want to write out a rough draft of your own cover letter before looking at samples because it can sometimes be very difficult to use your own phrases once you have other people's words in your mind. A cover letter written in your own words will highlight your most marketable and unique skills and bring out your personality in a way that a copied letter will not. Simply copying a sample letter will not show you in your best possible light. Copying can also cause problems for you if you plan to post your qualifications online on sites like LinkedIn. I have found several almost word for word copies of this sample cover letter that people have posted on their LinkedIn profiles. This kind of copying creates several problems for job seekers. hasn't provided a sincere description of his or her skills because the letter is simply a copy of someone else's letter. Please do take the time to write your own letter in your own words using this sample for guidance. It really is the best way to make the best impression on employers.